Wide leg corduroy pants in a rich navy hue. 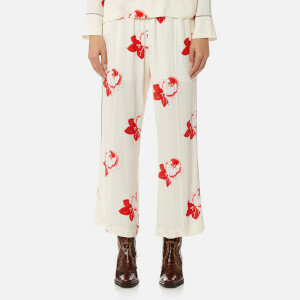 Cut from soft corduroy fabric with a fine wale, the Ganni 'Ridgewood' trousers combine subtle tailoring with a nod of playful design, pairing a high-waisted cut with an exaggerated leg width. The high-rise pants feature a button fastening with zip fly, two large side seam pockets and tonal belt loops. Two rear patch pockets also feature.